Are you trying to improve your content marketing? Wondering how to connect the dots between content and customers? In this article you’ll find important best practices, backed by research, to help improve your social media marketing. Brand new research from Content Marketing Institute and MarketingProfs shows that while there are universal challenges in content marketing such as measuring ROI and producing engaging content, there are certain best practices that mitigate these problems. Here’s our take on the research. 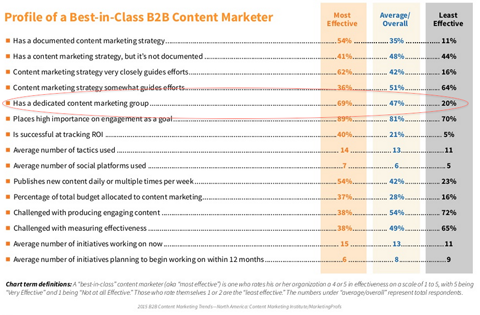 Fifty-four percent of the most effective B2B marketers have a documented content strategy and most of them follow it “very closely.” Furthermore, 60% of those with a written strategy consider their organization to be effective in content marketing, compared to 32% with only a verbal strategy. One of the biggest differences between effective content marketers and those who fail is a documented strategy. 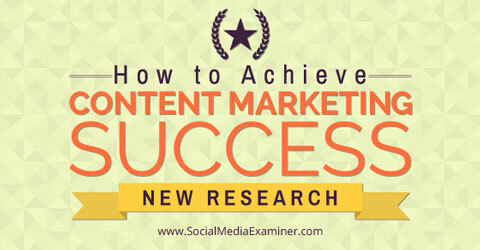 Find out what new research shows about achieving success with content marketing. Unlike a verbal strategy, which can be forgotten or misunderstood, a written document is “living” and can be referred to, modified and executed. The key takeaway is it’s much easier to follow through on a strategy that’s written than one that’s just spoken. While there is no cut-and-dried template for a content marketing strategy, your document should at least define your business goals, brand story, audience, content distribution channels, budget and resources, workflow or process and business model. Finally, make sure everyone involved in the content marketing process has a copy of the strategy, understands it and follows it. 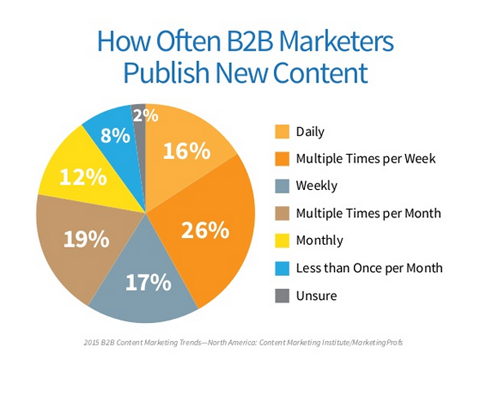 When asked, “How often does your organization publish new content that supports its marketing program?”, an average of 42% said either daily or multiple times per week. The research also indicated that having a documented strategy resulted in marketers publishing more content. 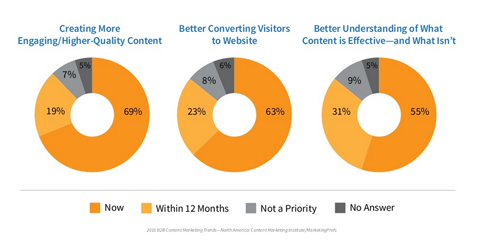 Content marketers are producing more content than they did a year ago. Overall, marketers from all company sizes—whether they considered themselves effective or not—are producing 70% more content than last year. The lesson here is that frequent publishing is no longer just the habit of a few ‘A-list’ B2B marketers, but anyone who is growing their content marketing efforts. Marketers have wised up to the benefits of content marketing, and even though they’re struggling with engagement (more on that next), the fact is they understand creating content is a first step in trying to connect with customers. Producing engaging content has been a nagging problem for B2B marketers for a long time. This year it’s something all marketers placed at the top of their priority list. 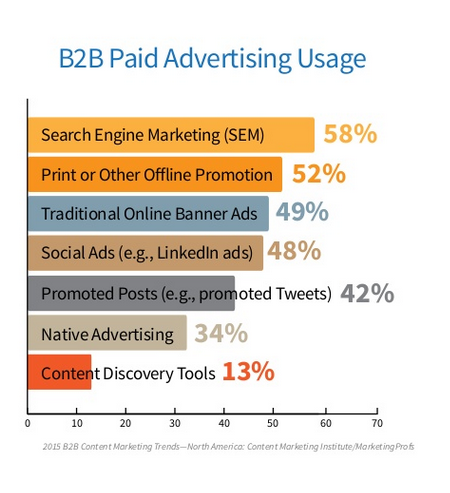 Creating engaging content is a high priority for B2B marketers across the board. Here’s where it gets interesting. Marketers who have a documented strategy are less likely (45%) to struggle with engagement than those who have a verbal strategy (57%) or no strategy at all (70%). Again, the lesson learned is having a written strategy is critical to all content marketing initiatives. Figure out why they should care about your organization and what you can offer them. Determine what content to produce, and when and how to deliver it. It’s best to document this kind of brainstorming, mapping and modification so marketers can execute it accurately. Ninety-two percent of B2B marketers use social media more than any other tactic. The most effective B2B marketers use an average of seven social media platforms. According to the research, LinkedIn is both the most popular platform (with 94% of B2B marketers using it) and the most effective for content promotion, according to 63% of marketers. No surprise there. 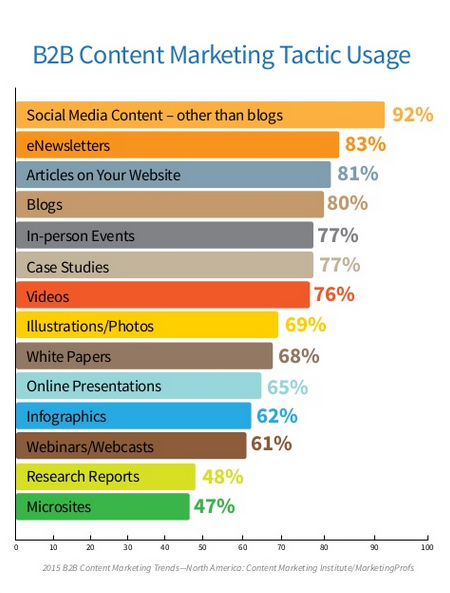 Other than blogs, social media is the most popular tactic for promoting content. Regardless of your industry or company size, it goes without saying that a blog should always be the hub of your content marketing efforts. Other than blogging, Jay Baer points out that LinkedIn publishing offers several key benefits for practically all businesses—among them, audience quality and overall reach. In fact even if you struggle to write about your core business topic, you may find you can break into topics that generally struggle to find an audience elsewhere on LinkedIn. That’s because on LinkedIn, an article is featured on a particular channel. Followers of that channel are able to see it and engage with it, giving you the opportunity to be featured on the channel’s slider. Fifty-eight percent of B2B marketers use search engine marketing (SEM), making it the top paid method for content promotion and distribution. Fifty-two percent also said it’s the most effective paid method. There are differences between usage and effectiveness of various content promotion tactics. It’s interesting to note the differences between usage and effectiveness. 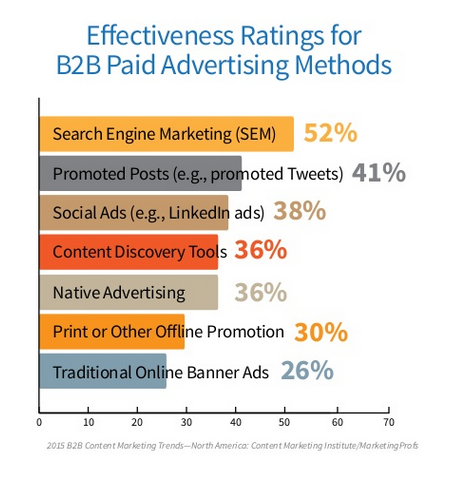 For example, B2B marketers still rely a lot on traditional online banner ads (49%), even though they don’t believe they’re very effective (26% effectiveness rate). Marketers still use methods they aren’t sold on. Yet newer content discovery tools (such as Scoop.it, Feedly or Buffer Suggest) don’t appear to be much on marketers’ radar, despite the fact that those who use them say they’re more effective than print, banner ads and even native advertising. The riddle of marketers using methods they don’t believe in makes sense if we go back to where we started—a documented strategy (or lack thereof). Whether for paid or unpaid content marketing, marketers who have a written strategy are more likely to follow it, measure for effectiveness and recognize the need to change gears if needed. Last but certainly not least, 69% of the most effective B2B marketers say having a dedicated group to oversee content marketing is incredibly important. This isn’t easy and it’s getting harder to find well-trained content marketing professionals. Having a dedicated group of professionals to oversee content is essential for content marketing effectiveness. Content marketing is now a formal business discipline practiced by 86% of B2B organizations. While marketers have matured in their content marketing practices, some challenges are still evident; e.g., engagement, measuring ROI and even low confidence in various tactics. But the good news is that more marketers understand the importance of having a content marketing strategy. Whether you’re challenged by measuring ROI, struggling to create more engaging content or just uncertain about the overall effectiveness of your efforts, research shows that having a written content marketing strategy is the single most important step you need to take. What do you think of these findings? Have you documented your content strategy? Do any of these findings surprise you? Share your thoughts in the comments below.